The inclination to hand-color photos has been around as long as photography has certainly. The New Process Photo-Color book, a pocket-size "palette" from the vast FullTable archives, is a self-contained book of pigment used to paint photos. Simply wet your brush and paint away. No skill involved, but guaranteed to make the most lackluster image shine. As you can see below, there are various styles and methods of coloring photos. I used to use Marshall's brand oil paints which were widely sold at photo supply stores for years, although watercolors, dyes and colored pencils are also useful. When using oils, it was essential to use fiber-base photo papers which allow for the oil to eventually soak in and dry. Before applying any color, I would coat the surface area to be colored with a clear, oil base solution to aid the color application. It would act as a vehicle and thin the color to provide transparency. 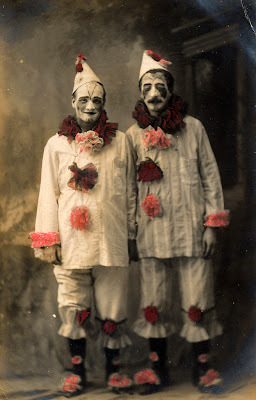 Le Clowns appear to be colorized with colored pencils, another popular technique. The texture of the photo paper usually is revealed by this method. Image from LovedayLemon's Flickrstream. My mother...Really! She has always been a rather free spirit, and when she left home at age 18 to work at Mt. 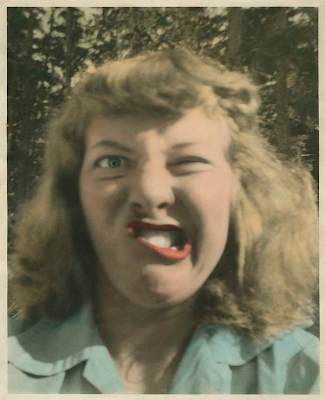 Rainier, she hand-colored this 8x10 self-portrait photo and sent it to her dear mom for Mother's Day. At the age of 83, she legally changed her name to Gladiola Flowers. Even now at age 85, and living in a nursing home, she is still just as colorful a character. The only thing she colors now however, is her purple hair. 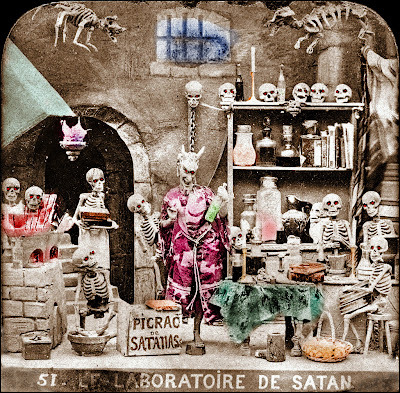 The Laboratory of Satan. This partially hand-tinted image is one half of "a stereoscopic French devil tissue view (diablerie) from the 1870s", as explained by Wolfgang Wiggers on his Flickrstream. "These tissue views are made of three layers. First is the normal albumen photographic paper. Second is a painted tissue behind the photograph. Third is a white protection tissue. If you hold the picture against a light, the colors come through. The glowing eyes of the skulls are pinpricked and labeled with a red translucent material." Is that green absinthe Satan is drinking? 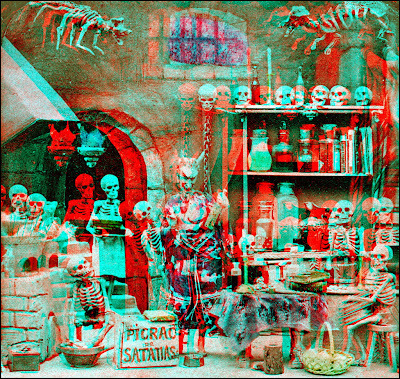 Below is the same image converted to anaglyph using the freeware stereo image editor, StereoPhoto Maker. 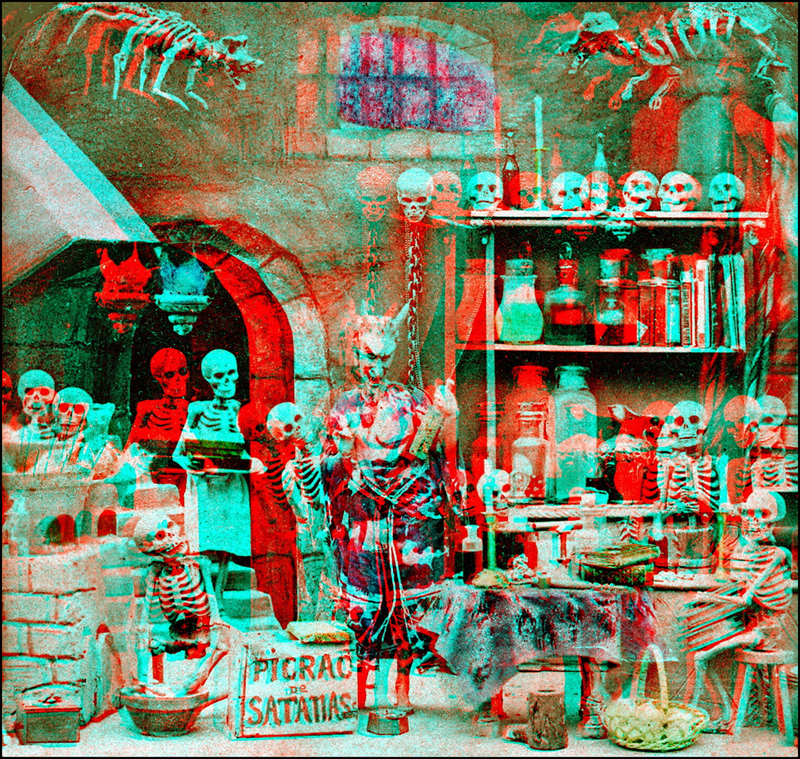 If you have any 3D glasses on hand, you can actually view Satan's workshop in 3D.